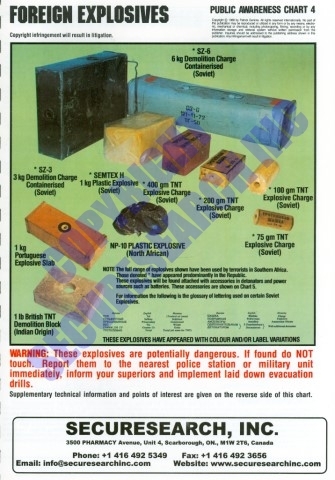 Poster of Foreign Explosives. Terrorists have ready access to stolen or cached (spoils of war) and black market military explosives in many countries. This poster shows examples of primarily Russian demolition explosives smuggled to insurgent groups in Africa. The former Soviet Union (FSU) distributed explosives and other weapons to militants, revolutionaries and insurgent groups around the world for almost 50 years, and these explosives are also freely traded on the black market. It is important that police, security forces and security screeners are trained to recognize these products and their hazards. Note that all of the posters in this series of 18 are also available in a book of technical descriptions and explanations, written by Patrick Gericke, publisher of the posters. He is a de-mining expert, veteran of both the Rhodesian and South African armed forces and a security expert specializing in terrorist weapons and explosives. When placing an order, you can use the above shopping cart, phone us at 1-800-452-3130, email sales(at)securitytrainingposters.com, use our contact form or download an order form and fax it to 1-888-501-4116. All pricing is in US Dollars. We contact you after receiving your order to confirm your order details and all pricing including any applicable taxes, whether you will be using a purchase order or other payment method as we accept purchase orders, Visa, Mastercard and checks and to confirm your shipping address and any specific shipping needs. All Security Posters Are In Stock And Include No Charge Ground Shipping In North America. Rush delivery is available. Pricing includes applicable sales taxes for all USA Orders. If you are ordering from outside North America, we ship via most economical means and quote shipping costs and any applicable taxes prior to shipping. Rush delivery is available. © 2019 securitytrainingposters.com. All Rights Reserved.